Mike Pavlick of Illinois-based Golden Triangle Whitetail offers trophy whitetail and turkey hunting packages in Illinois' Golden Triangle. Experience a quality whitetail hunt in the heart of Illinois' big buck country with Golden Triangle Whitetail. We manage our 13,000 acres of private land with one goal in mind—to put you on the buck of your dreams! 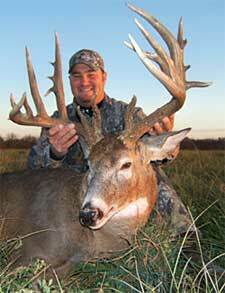 Illinois is home to monster whitetails bucks. And Golden Triangle Whitetail is located in the heart of big buck country—Adams, Brown, and Pike counties—the west-central portion of the state. These countries are known as deer hunting's "Golden Triangle" because they have dominated the Pope & Young and Boone & Crockett listings in recent years. That's why you've read about them in your favorite hunting publications. If you're a serious hunter, you owe it to yourself to experience a hunt in the Land of Lincoln. We strictly manage each farm for trophy whitetail. We do this in several ways. First, we only buy or lease farms that hold a lot of deer, and have the habitat to produce quality bucks year after year. Second, we don’t start hunting until the third week of October, or the pre-rut phase. No one sets foot on these farms before hand to ensure minimal pressure. Third, we limit the amount of hunters we take on each property, not the amount of bucks we harvest. We do expect our hunters to only harvest a mature 140 + buck. However, we also tell them if it’s the biggest buck you have ever seen, shoot it. Remember, this is not supposed to be only a hunt, but an enjoyable experience. We treat it as both. An abundant turkey population provides the spring hunter with the utmost challenge. It is not uncommon to see flocks of 20 to 30 at this time of year. Call or E mail us for more information on our turkey hunting packages. For more information on available dates and price quotes go to the Golden Triangle Whitetail web site below. To book a hunt now call: 708-828-2378 or E mail.